This blog is part one of a series of posts I am writing on creating effective strategies to improve your performance. I am writing these strategies with climbing in mind but can be applied to any sports, or from career/job aspirations to general exercise motivations/well being. Over the past few weeks I have read a number of psychological training books and I am combining a summary of this knowledge with my own yogic and climbing perspective. In any sporting field we wish to perform in or at least participate well in, there is a vast array of knowledge on physical training and how to prepare our bodies. What I feel is sometimes acknowledged but often over looked is the mental preparation required for all our endeavours. Mental preparation and development is paramount to success and Im hoping to breakdown some things I've learnt here into sizeable and rememberable chunks. All of my writing and summarising is a combination of what I've read and what I've learnt first hand. Through my own errors and mistakes I'm learning to improve, to challenge myself and Im hoping by using the tips Ive written about here to progress my own climbing even further. Hopefully you will read or learn something that you can take away with you and use in your own training. and we can help give each other psyche along the way! In all our training plans and strategies, considering the fundamental process involved in attaining skills is worth acknowledging. Acquiring any skill requires 'deep practice' as referred to in 'The Talent Code' by Daniel Coyle, this deep practice aids to develop not only the requisite muscle groups but also allows for the development of neural circuits in the body and most importantly Myelin. Myelin is the neural insulation that wraps around nerve fibers, making signals sent through the nerves faster and stronger. In his book on skill development, Coyle describes the importance of developing this Myelin so that overtime the body can execute skills intuitively, with more speed and accuracy, essentially firing on demand. Myelin grows in response to certain signals, meaning practice. The more you try something, the more your body can respond to the demands being placed on it and adapt to create function. In climbing the process of developing a wide variety of skills, a wide variety of movements is extremely important. You want to have prepared your body in such a way that it intuitively knows where to shift weight to hold minimal holds and move efficiently, that it knows how to hold a wide variety of holds and use them to move off of, you want to be able to read upcoming sequences and know that in difficult sequences your body will know how to complete them. You want to get to the chains or the top of a boulder and feel that joy that your trained body executed the skills required of it. So here is where the mental training comes in! To do all this you need to mentally acknowledge the process involved in deep practice. You need to turn up to every training session, knowing that the skills you work on today are building blocks, are recorded pieces of data that you can call upon again in performance to assist you in success. So when your mind wanders to thoughts of goals, or 'projects' or outcomes, you need to reel it back in, in a sense, at every training session, reminding yourself to focus on skills that you need to build up, 'How am i on steeper angles? ', 'How am i on crimps? ', 'How am I with slopers?'etc. By building up a wide repertoire of skills, you will then have a wider number of those skills you can call upon and overall develop yourself as a better climber. This process is about obviously as mentioned the physiological benefits but to get there this process needs to be acknowledged and appreciated in your mind and remind you of the journey to achieving whatever it is your goals are. To train effectively and acknowledging this process, start to measure YOUR own performance, yes! not that of anyone else at the wall or at the crag! After very session or day out, record your performance, Larry Basham refers to this as 'A Performance Journal' in 'With Winning in Mind'. In this way you can record how you are doing overtime and be acutely aware of where you can improve and where needs more work. To focus on yourself and release the need to compare to others can create an immense amount of freedom for you. Of course we can look to others for inspiration, for motivation, for tips on how to improve but ultimately we are all different, and you will never reach your own personal potential if you constantly measure yourself against others around you. Of course with all this process involved it is still really beneficial to have goals, but do set your goals mindfully, in all your goals setting incorporate the process. Instead of having ONE goal, have a number of steps along the way. 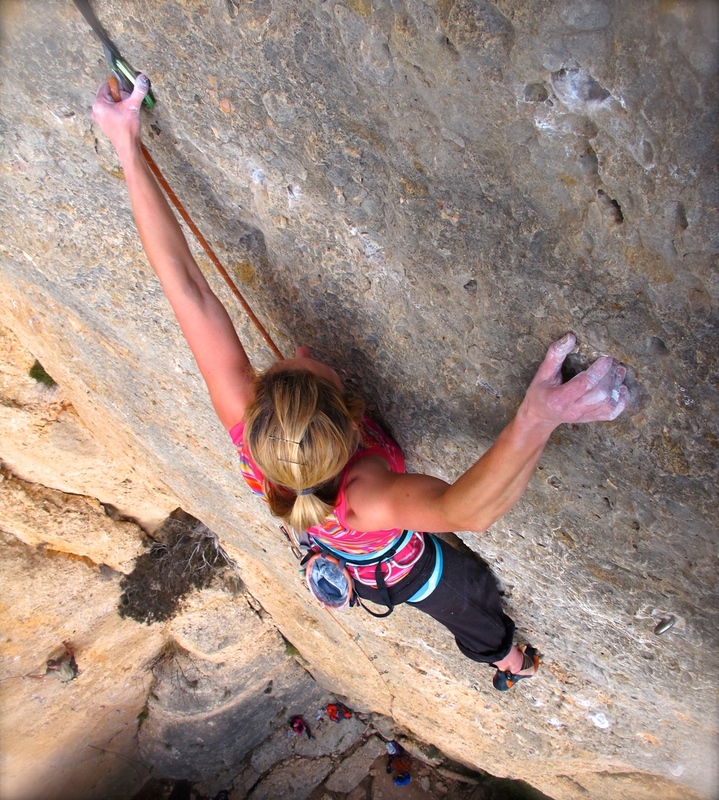 In 'Climb Strong's- Successful Sessions - 34 Training Tips for Better Rock Climbing', this climbing tip is referred to- 'Beware of the cusp grades' Instead of getting sucked into one area with which to measure yourself off and create pressure to succeed, having a number of goals can allow for more areas in which you can congratulate yourself or reward your efforts. With having a number of goals as stepping stones perhaps to a greater goal, you give yourself the opportunity to maintain enthusiasm, to constantly observe improvements, in turn boosting confidence. Of course the final aspect of acknowledging this process is acknowledging that it will take a LONG time! we all want fast track results, we all want to feel like we only had to train for three weeks and then we got our project! But this doesn't always happen! 2) Create a list of training techniques/strategies that will work on the skills/areas you wish to improve. 3) Create a list of goals that incorporate skills you wish to improve and have them as measuring guidelines to indicate if your training is working. 4) If you have a specific goal or number of goals e.g. a grade or a specific problem/route, add that to your list of goals to keep in mind while training. 5) After every training or climbing session, write how the session went in your performance journal, keep this very specific, what did you do, what could you not do and how you work to do that in the future. 6) Assess your mental attitude to long term commitment and the process of training, are you psyched, excited, do you enjoy the idea of training? If training seems like an obstacle, a chore, a boring activity, it will feel much harder to develop skills and in turn feel much more demoralising as you do not see your performance improve. Decide how you can improve on this, reward yourself for efforts during training, praise yourself for little improvements, praise those around you and notice their efforts and their improvements. Climbing in Montsant-Ive begun my year this year, working towards and achieving a number of interim goals, more onsights and flashes in the low to mid 7's, generally consolidating in grades that are achievable but still provide a little challenge, this allows me to feel more confident, more relaxed and assured while working weaknesses and aiming towards a new grade.